I noticed that widgets page is not accessible for users that navigate with keyboard. A good point is that drag and drop is not the only solution to add a widget into an area but this page needs some enhancements to be accessible for keyboard users (blind people, people with motor disability, and even people with no handicap). Available widgets can't be focused. Solution : If we add a "tabindex="0"" attribute on ".widget.ui-draggable" elements, we can focus them and open it just like a click. And we need to add a focus style to see focus on elements. A keyboard user can't select the area where he wants to add the widget because a TAB or arrow navigation automatically select the following choice. So he can just add widgets in the last area. Solution : deactivate TAB navigation on elements and just allow arrow navigation. This would be equivalent to radio buttons navigation. TAB would be just to go to "Cancel" or "Add widget" button. Also add a screen reader text to tell which choice is selected (blind people can't see the checked icon). This page is divided into 3 parts : "Available widgets", "Inactive widgets" and all widgets areas. The "all widgets areas" has not title to quickly navigate into it. Widgets in areas can't be deactivated with keyboard because we need to drag them back. Solution : Add a link "Deactivate" next to the "Delete" one. Widgets areas can't be opened with keyboard because arrows are "div"s and not buttons. Widgets in areas also have an arrow to hide / show. The arrow is a link and that's a good point but there no text in it. 40677.diff​ (10.7 KB) - added by afercia 14 months ago. 40677-headings.diff​ (4.4 KB) - added by afercia 14 months ago. Thanks for your ticket, @juliemoynat! This issue was being tracked in #31476, and should be entirely fixed as of 2 days ago in 40569. If you can install the beta version of WordPress 4.8 and verify that all your issues are addressed, that would be great, but if there are further issues, please comment on #31476 to address them! Thanks for sharing and helping out! See  and . However, they fix just a part of the accessibility issues in the Widgets screen. Worth noting this screen has also an alternate mode, can be enabled from the Screen Options, see Enable accessibility mode, that's recommended especially for keyboard users and screen reader users. @joedolson I've installed WordPress 4.8-alpha-40576. Can you confirm that #31476 correction is in that version? If so, I confirm that my ticket is not a duplicate of #31476 because Widgets page doesn't work better with keyboard. An accessibility mode should be accessible into the screen, not hidden into an accordion. I will test this accessibility mode as well. An accessibility mode should be accessible into the screen, not hidden into an accordion. Yep, right. Ideally, the same content should be served to all users. Personally, I don't support alternative modes or "accessible versions" as a viable solution for better accessibility. The Widgets screen "accessibility mode" is there for historical reasons, and I guess it was implemented years ago with a good intent. However, modern applications should be accessible out of the box. 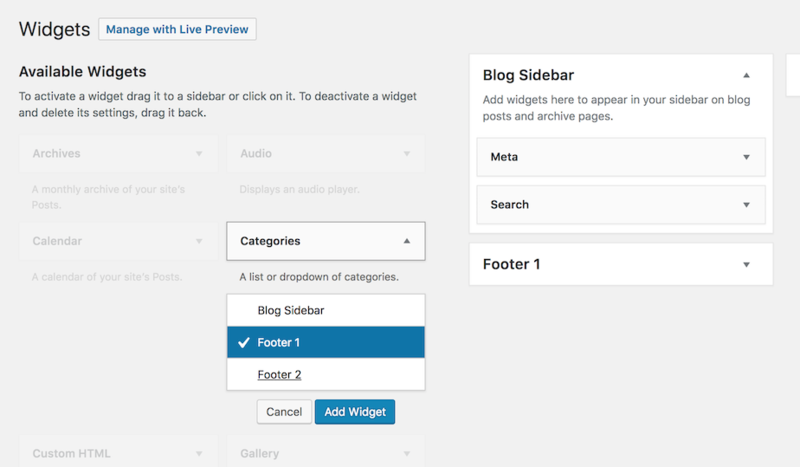 As noted in #40678 this screen, together with the Menus one, the media views, and the customizer, are the most critical areas in WordPress for accessibility. The Widgets screen would need some big refactoring primarily because the drag and drop functionality is hard to use with a keyboard. I really hope there will be the chance to improve this screen in the next future and contributors interested in helping out. See also #42778 which aims to make the "Accessibility mode" link more discoverable. Note: working on a patch for this. I've split the issues this ticket aims to solve in 2 separate patches. However, all the headings below should be bumped up by one level. It's possible to do that in a slightly hacky way, which doesn't make me so happy. However, things get even more hacky because when adding a widget, or dragging a widget from the left column to the right one and vice-versa, then the widget heading should be changed on the fly, for example from a h3 to a h4 or vice-versa, in order to preserve a correct headings hierarchy. 40677-headings.diff​ experiments this approach but I think it's extremely fragile, and I'm really not sure it should be done. Better ideas welcome. I'd recommend to split this in a separate ticket as I think it should be discussed with the Customizer and Design teams. 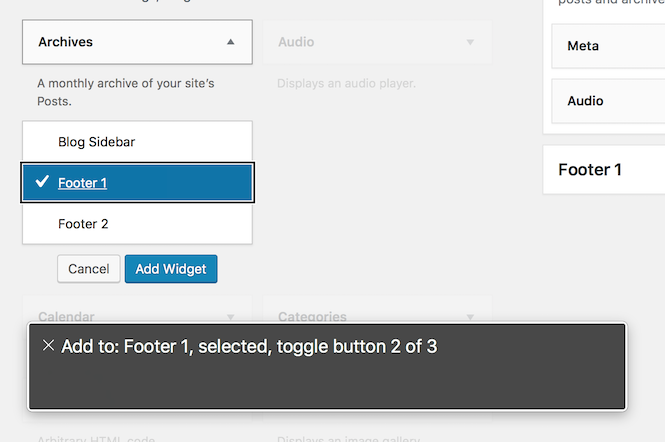 Accessibility: Widgets: Make the "Available Widgets" section operable with a keyboard. also some improvements for assistive technologies. FYI: Small regression in Customizer introduced by  as reported in #43983. Customize: Hide expansion arrows in Customizer's available widgets list. Fixes regression introduced by . Reopening for 4.9.9 consideration as seen during accessibility team bug-scrub meeting.